More classic articles about the show; here's how it looked at the beginning. Bookending my post with People's story about "The Last One", here's a very early review of the series which ran in the New York Times between the third ("Down's Syndrome") and fourth ("Cora and Arnie") episodes of the series, "NBC's Stylish St. Elsewhere". The camera keeps moving, the stories keep changing, the tone and mood keep shifting. But the series, created and produced by Joshua Brand and John Falsey, is holding together remarkably well. The younger actors, especially those mentioned above, have already established their characters solidly. The scripts do manage to explore generally unusual areas in the hospital-story genre, including, in next week's episode, the sensitive issue of astronomical bills. Their talents are in brief but impressive evidence at the close of tonight's show, when Mr. Lloyd recalls for Mr. Flanders how he used to go to the opera as a child with his father. It is the kind of passing moment that makes ''St. Elsewhere'' something very special and rewarding. about going to the opera as a child. Fortunately, his wishes were granted. 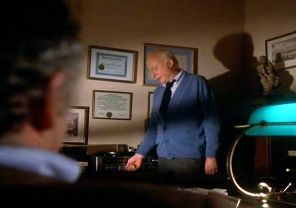 Norman Lloyd, despite being billed as a featured player in season one, ends up getting a lot of screen time and things to do, and gets promoted to the main cast for the remainder of the series. (In an early episode, someone, Ben Samuels I think, comments about Auschlander's liver cancer and bets that he won't last six months.) And Ed Flanders' performance in season one was rewarded with an Emmy for Outstanding Lead Actor in a Drama Series. I mentioned recently how St. Elsewhere is often remembered for its audacity and quirkiness, but like John O'Connor observed here, the show is rich with little moments like this one, ones that where the characters are fleshed out into people with depth. Touches like these make me like and care about characters on television shows.